LOCATION.--Lat 40`59'55", long 75`08'35", Monroe County, Hydrologic Unit 02040104, on left bank at Minisink Hills, 500 ft upstream from Marshall Creek, 0.8 mi upstream from mouth, and 3.0 mi southeast of East Stroudsburg. PERIOD OF RECORD.--November 1950 to current year. GAGE.--Water-stage recorder and crest-stage gage. Datum of gage is 301.84 ft above National Geodetic Vertical Datum of 1929. Prior to Aug. 19, 1955, water-stage recorder, and Aug. 23 to Nov. 24, 1955, nonrecording gage at site about 1,300 ft upstream at datum 2.19 ft higher. 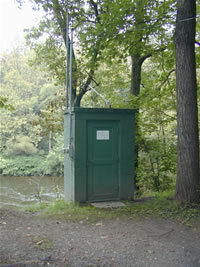 Nov. 25, 1955 to July 24, 1956, nonrecording gage at site 40 ft upstream at present datum. Satellite telemetry at station. Supplied by NWS: Action stage-8 ft; Flood stage-10 ft; Moderate flood stage-12 ft; Major flood stage-15 ft.